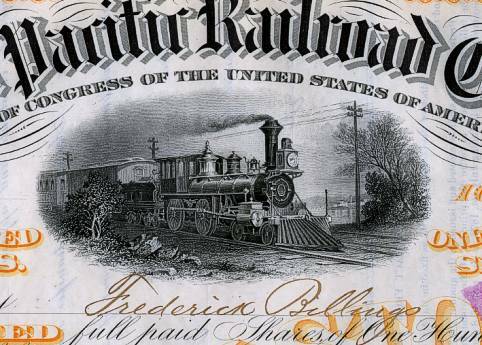 Beautifully engraved certificate from the Northern Pacific Railroad Company issued no later than 1878. 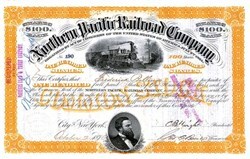 This historic document was printed by the National Bank Note Company and has an ornate border around it with a vignette of a train passing by telegraph lines in the countryside and a lower vignette of Fredrick Billings. 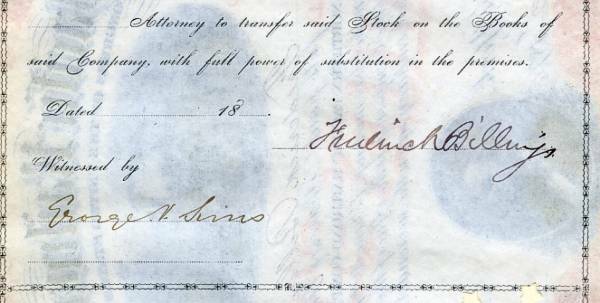 This item is hand signed by the Company's President and Treasurer and is over 138 years old. The certificate was issued to and hand signed on the back by Frederick Billings. Billings, Montana was named after him. On July 2, 1864, President Abraham Lincoln signed an Act of Congress creating the Northern Pacific Railroad Company. It would have its eastern terminus at Lake Superior and its western terminus at Puget Sound. Much of its route was to follow the route of the famed 1804-1806 Lewis and Clark expedition across the unchartered West. Financing for the new railroad did not come about for several years, and it was not until 1870 that groundbreaking took place near Duluth, Minnesota. First stirrings of activity on the west end of the projected transcontinental began at about the same time. By 1883, only 300 miles remained between the two railheads. Jay Cooke at first managed the enterprise, but on September 18, 1873, the Northern Pacific and Jay Cooke were crushed by the Financial Panic of 1873. Things did not improve in 1874, with no credit available and no cash to continue construction. The Railroad was reorganized by Fredrick Billings in 1876 and by early 1877 it began to slowly move forward. By the end of 1878, the only construction being performed was inconsequential preparation work for the years ahead. Under the leadership of Henry Villard, the Northern Pacific was opened in 1883 from Ashland, Wis., to Portland, Oreg. The company became the Northern Pacific Railway in 1896. In 1901 there was a spectacular financial contest between the interests of E. H. Harriman and those of James Hill and J. P. Morgan for control of the Northern Pacific. The Hill-Morgan group secured control, but an agreement between the two groups resulted in the organization of the Northern Securities Company, a giant holding company that controlled the Northern Pacific, the Great Northern, and the Chicago, Burlington & Quincy. When the trust was dissolved (1904) as a violation of the Sherman Antitrust Act, the Hill-Morgan interests came into control of the Northern Pacific. In spite of the breakup of the Northern Securities Company, a proposal for a very similar merger was made by a consultant for the Interstate Commerce Commission in 1921. The plan was never acted upon, but 40 years later the Northern Pacific again asked for permission to merge with the Great Northern and the Burlington lines. Finally, in 1970 the Supreme Court approved the consolidation. The merged company became the Burlington Northern Railroad, which in 1995 merged with the Santa Fe line to form the Burlington Northern Santa Fe Railway .